Today marks the last big milestone, my 300th beer. It is hard to believe I have made it this far. Even know there are 65 more beers I have to drink, a bit over two months, it feels like the home stretch. As much as I have enjoyed doing this and getting the chance to try beers I would have never probably given a second glance, I can’t wait until it is over. At times it seems like it has overtaken my life. It can be a pain pouring, taking a photo, tasting, & blogging when away from home weather on vacation or just a family gathering or just after a long day at work. 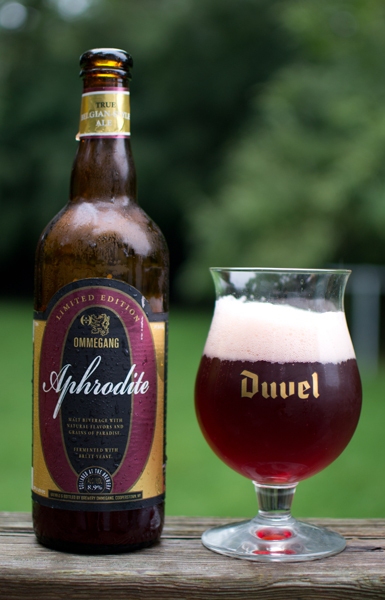 With that said…let me introduce beer #300…Aphrodite by Brewery Ommegang. Brewery Ommegang brews this Fruit Beer in Cooperstown, New York. The ABV comes in at 8.9%. Aphrodite as you may know is the Greek Goddess of Love and Lust. The Goddess of Love (Lust) poured a ruby red with a large pink head. The lacing left behind was quite nice. Raspberries…no doubt about it on the nose. A bit of pear and watermelon were also there. The watermelon was interesting in that it is not an aroma I have really picked up on in other beers other than a specific watermelon beer. Yeast and bread crust round out the nose. I took a sip and man did I pucker up, this was quite tart. The raspberries greeted me first in the taste along with blackberries. This was quite the berry-licious beer! About mid mouthful, it got a bit sweet with grapes and some black cherry flavors. Near the end it got tart and a bit sour with a hoppy grass like flavor. It had a solid medium body with a bunch of very fine carbonation. The alcohol was hidden nicely here. This was quite refreshing to drink. I was digging this, I’m a fan of Fruit Beers and raspberries so this was right up my alley. One thing I didn’t like about it was the price. At $15.99 for the 750 ml bottle (same size as a typical wine bottle)…it was the most expensive beer I have had. My wife thought this was one of the best beers she has ever had. I wouldn’t go that far…but it was quite good. 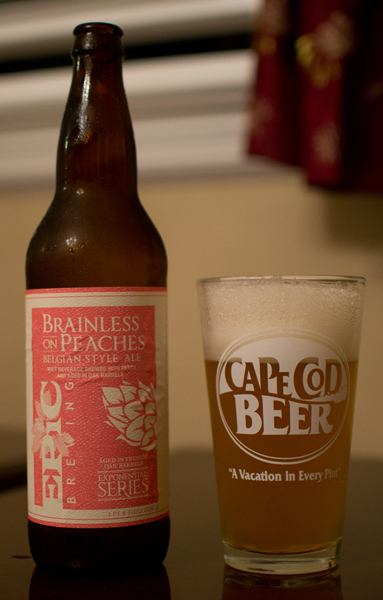 Beer #298 is Brainless On Peaches Belgian Style Ale by Epic Brewing Company. This beer is from Salt Lake City, Utah and is brewed in the style of a Fruit Beer with an ABV of 10.5%. According to the label, this is a limited release and I am holding one of 1800 bottles of this. This bottle is release #4 and was brewed on January 15th, 2010. Looks like this beer has been doing a bit of aging. It poured a hazy gold with a bit of orange color to it. The head was huge and off-white and fluffy. It left some nice lacing in the glass. It was very fragrant with peaches, honey, yeast, and grapes…very much like wine. It reminded me of wine with the taste of grapes and peaches. It was slightly sweet. Those familiar Belgian yeast flavors were also here along with a bit of wheat near the end. This was highly carbonated with a medium body bordering on being a bit syrupy. The high ABV was hidden quite nicely. I love peaches and I liked this quite a lot. This beer is a year and nine months old and according to Epic’s website, it should age really well. I may just get another bottle of this if I can still find it and cellar it for another year or so. Peach lovers…try this one on for size. Beer #257 comes to me from Colorado, Idaho Springs to be exact. 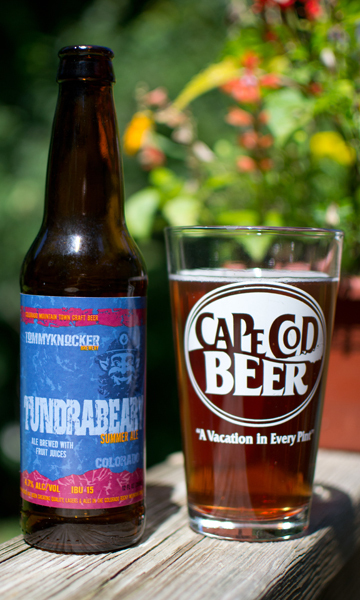 Tundrabeary Ale is brewed by Tommyknocker Brewery in the style of a Fruit Beer. The ABV is fairly light at 4.7%. It poured a clear amber with really no head whatsoever. The nose was very light with a generic berry like aroma…and that was about it. The taste was odd, it had a bitter fruit juice thing going on. There was maybe a bit of raspberry buried in there but it was truly hard to tell…again…like the nose…I would say a nondescript berry flavor. Very light body with low carbonation didn’t make this satisfying at all. I think this is one of the worst Fruit Beers I have had. It reminded me of my wine cooler days that are thankfully very much in the past. If you see this on the outside…steer clear. There are so many other better beers in this style to choose from that I just don’t see why one should waste their time with this one. Lets take a journey overseas, across the great pond as they say, to England for beer #254. 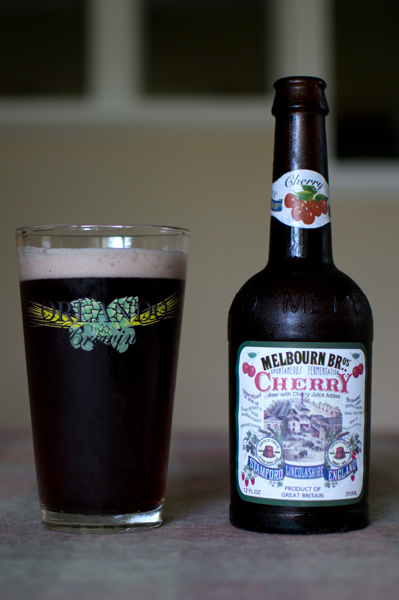 Brewed by Melbourne Brothers Brewery, Melbourne Bros Cherry is a Fruit Beer with a very low ABV of 3.4%. The label on the bottle reminded me of Smith Brothers cherry cough drops that I consumed like candy when I was younger. They really did taste like candy as opposed to medicine. The color of this beer was a dark reddish brown with, get this, a pink head.That head left some really nice lacing behind in my pint glass. Cherry is the word of the day when it came to the nose. It had a really deep, intense cherry aroma that was very pleasant. The taste was more of the same, cherries. It was nice and tart and a bit sweet. It was like carbonated cherry juice. Pretty simple. It didn’t taste like fake cherry either like the way some cherry flavored candy tastes like. It had a dry finish to it, was quite light body wise and had just a tad bit of carbonation that gave a slight fizziness in the mouth. With the ABV so low, I could probably have someone taste this and they would be hard pressed to identify it as a beer. To be honest, I kind of liked it. It didn’t knock my socks off but it wasn’t totally horrible either. I’m probably going to rate this higher than I should but to each his own and this is my blog after all. As the summer quickly rolls on and beer after beer are consumed, I start to think of many things. One of those thing being that ever so slightly I can see the light at the end of the tunnel, or beer #365 that is. I wonder to myself what should be that beer, #365? I think it should be something pretty special…I was thinking maybe Tequiza. I kid of course. Sad to say there was a time in my life where I actually liked that stuff and it is good to know it isn’t made anymore. Beer #365 is still quite a few away, so instead of thinking about that, lets try another beer in the long line of beers I have had. 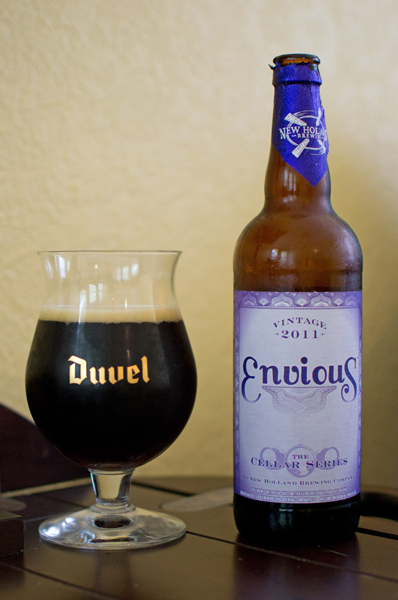 Beer #251 is Envious Vintage 2011 by New Holland Brewing Company. Brewed and bottled in Holland, Michigan, this Fruit Beer has an ABV of 7.5%. It is part of New Hollands Cellar Series although I’m not quite sure that exactly is other than maybe a special run they brew? On the label it mentions this was brewed with pear juice and raspberries. Sounds like something I will like. Into my tulip glass it went with a very dark brown color and a tan colored head. I picked up the glass to take a whiff with thought of pears and raspberries on my mind and sure enough there was a nice light raspberry aroma coming from the heavier caramel malts. There was also a slight chocolaty smell here too. I took a sip…dark fruits take over in that department. When I say dark fruits, I usually get raisins or a plum like flavor. Towards the middle of the sip, I picked up, very slightly, that raspberry I picked up in the nose. It finishes kind of bland and nondescript. The mouthfeel was decent, medium bodied with low carbonation. It was very smooth and the alcohol was hidden really well. Overall I was really disappointed. I wanted to taste the pear, I didn’t (although my wife did). I wanted the raspberries (which I love) to make a bigger appearance, they also didn’t play that big of a part here. I did finish the bottle though so it wasn’t all bad. Onwards I roll…to beer #365. Beer #233, Tropical Mango Pale Ale by St. John Brewers sounds quite refreshing on this hot and humid day. Will it be or will it just be another run of the mill Fruit Beer? Lets give it a try…shall we? 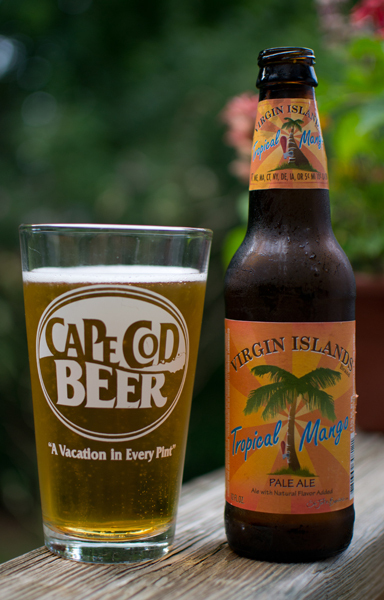 St. John Brewers is from the US Virgin Islands (actually this is brewed by Shipyard Brewing Company from Maine) and they brew this Fruit Beer with an ABV of 4.5%. It poured a clear light golden yellow with a tiny white head. Wow…the nose was dark chocolate…I kid…there was no mistaking the mango aroma along with tropical fruits such as pineapple and kiwi mixed in with a bit of what I thought was a strawberry Quik like smell (if you have had this…you know what I’m talking about). Judging by the smell…I was looking forward to tasting this. But oh how this took a turn for the worst. All of those nice aromas did not show in in the flavor. There was maybe just a hint of the fruit up front but it disappeared very quickly into a very grainy, metallic, chemical, and grassy tasting mess. It left quite a nasty aftertaste that I really couldn’t describe…just plain yuck. This was a light bodied brew with an ample amount of carbonation. Happy Independence Day everyone! And a big Happy Birthday to the United States of America! Today is its 235th birthday. I was going to have a red, white & blue beer today in celebration but just decided on having the blue variety. 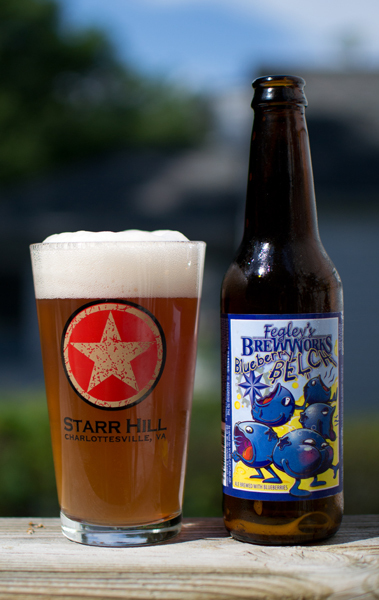 Beer #218 is Fegley’s Brewworks Blueberry Belch by Allentown Brew Works from non other than Allentown, Pennsylvania. This Fruit Beer, with an ABV of 4.2%, will be my “blue” beer. This is brewed with honest to goodness blueberries and has 150 pounds of that delicious fruit in each 15 barrel batch they brew. Sounds good to me! Into my Starr Hill pint glass went this cloudy amber brew. It had a huge frothy white head that went away far too quickly, almost too fast for me to capture in a photo. There was no mistaking what fruit was used to brew this with as the nose was blueberries and wheat. The taste was tart and slightly sweet blueberry but not overpowering. I felt the wheat and grainy bread flavors where more pronounced. I have said it before and I will say it again, I really dig these Fruit Beers. Mouthfeel was nice with a noticeable amount of stinging carbonation and a light body. This was quite refreshing and I could easily drink quite a few of these on a hot summer day such as this one was. I really liked this one quite a bit. If you dig blueberries, give it a try. So I raise a toast to the good old Untied States of America! Happy Birthday once again!